A wonderful opportunity for our Year 9 and 10 students to show off their entrepreneurial skills! 7C2 making models of the solar system. 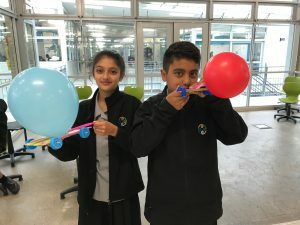 Students from 7F2 learning about the laws of motion by building “blow karts”. 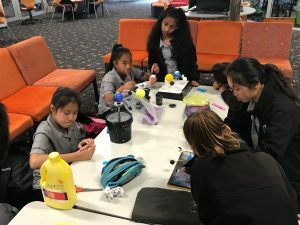 Students at Mission Heights Junior College enjoy many opportunities and are able to learn in an environment which has been specially designed for students of this cohort or age range. Instead of a two year, which some refer to as the “revolving door” experience of an intermediate school where it is difficult to establish strong relationships in such a short time, teachers are able to get to know and support our students over four years. Positive and caring relationships are the key to positive well-being and academic achievement. The whanau structure of the school or schools within schools model further increases the quality of the relationship as students usually remain in the same whanau the whole time and with the same Learning Advisor and Senior Leaders. Having only 200 students in each whanau led by two experienced senior leaders ensures personalised and individual attention. The middle college years are important for maturation and the building of a strong personal identity. Being grouped together at a time when they are neither primary nor senior secondary is a distinct advantage at this stage of their personal development. Being shielded for two years from some of the negative influences of senior students to which Year 9 and 10 students at senior colleges are exposed is an obvious benefit to our students at this impressionable age. Positive friendships are also important factors for wellbeing and achievement. So it would be an advantage for students to transition to a senior college together from a junior college rather than disconnect before the end of Year 10. Our students are able to grow without the constraints of having older students above them. We see incredible confidence and maturity in our senior students as they are the leaders of the school and occupy leadership positions that would normally be taken by Year 11, 12 or 13 students in a senior college. The image of trees fighting for sunlight in a forest comes to mind – our students can grow taller and stronger without a canopy above them. Our curriculum has been carefully designed to ensure students receive specialist teaching from Year 7 to 10. Our students, having received excellent general foundations at primary school are ready for the next phase of specialised teaching. They are taught by a range of expert teachers rather than one home room teacher as in an intermediate school who may or may not have the same skills across all learning areas. The integrated curriculum learnt within a context is also enjoyed by students who can see the relevance of their learning in the real world. Crucially students are able to receive the undivided attention of our teachers who are not distracted by the work-load of NCEA or CIE assessment which starts in Year 11 and continues to Year 13. Many of our teachers comment on how refreshing it is to return to the true meaning of discovery learning rather than “learning for assessment” required by senior courses and our students benefit as a result. We believe that our students are well prepared for senior college and while gathering credits for NCEA is not our core business we do give our Year 10 students an opportunity to attempt achievement standards in most of their subjects. This gives them a taste of the NCEA process and an opportunity to carry some credits into Year 11. Please select 4 option subjects but you will only study 2. This is because some Options may not be offered if only a few students select it, or some Option course may be over subscribed. Please note the following selection restriction that is applicable to the Technology Options, and Visual Art/Design & Visual Communication. Business Studies enables you to look and appreciate the issues that challenge business in a rapidly changing world. As citizens it is important that you are able to make informed and rational decisions about business matters. In Business Studies your year will be broken up into three sections; business studies, economics and accounting. This enables you to get a taster of each before heading into Level One. In Business Studies you will be looking at different products, target markets and how they are sold. This will lead onto a NCEA Standard which allows you to gain 4 credits. Accounting will allow students to explore financial statements and make decisions about whether the business should continue or not. Finally, Economics will allow students to look into supply and demand. Business contexts often offer opportunities to integrate learning across a number of different subjects or learning areas and has strong links to everyday life. Business Studies offers opportunities for practical and creative thinkers as well as for those interested in money! In Media Studies you will learn to explore media concepts with critical awareness and have practical experience in production work. This course can give you essential skills and expertise as you progress to senior Media Studies, and beyond. You will develop the ability to communicate confidently as you work in production groups developing media products such as short films. You will develop flexibility, problem solving and openness to new ideas. You will experience “hands-on” use of technology such as cameras and digital editing software. You will be able to critically interpret a wide range of media. Your group project experiences will enhance your problem solving skills and ability to use your creative skills to produce a finished product to fit a brief. This option focuses on practical art-making. In Visual Arts opportunities will be given for you to express yourself effectively and extend your range of skills, knowledge and techniques using a variety of media and processes. These may include drawing, painting, printmaking, sculpture and design using both traditional and contemporary approaches. You will be encouraged to use technologies, including emerging applications in digital media within your work. course. There will also be an opportunity to participate in a Level One NCEA Achievement standard which focuses on using a range of wet and dry media. *This option is a prerequisite if you are considering taking Graphics at senior level, as Graphics is part of the Visual Arts programme – not to be confused with D.V.C. Design and Visual Communication (DVC) is a main communication tool, it is an international language therefore, it enables students to show their ideas avoiding languages barriers. The Year 10 DVC course lays the foundation for Year 11 DVC and future years and it is based on the Year 9 DVC course, though no previous experience is required to take this option, it is ideal as a continuation of Year 9 DVC. This is a course with the emphasis placed on creativity and individual choice, developed to meet the needs of today’s students and tomorrow’s citizens. The programme is developed around briefs that are based on realistic and thought provoking situations. This course stimulates students’ self confidence, self esteem and pride in achievement through enabling them to reach personal success. DVC is taught through to Year 13 level and further study is available at Technical Institutes and Universities in such areas as architecture, graphics design, engineering, interior design, advertising, computer graphics etc. Students will have the opportunity to gain 6 credits in NCEA Level 1 towards Technology, Visual Arts, Graphics and Design. This course involves using technological practice to develop food solutions that meet a design brief. You will co-construct your focus area and develop your own design brief. You will have the opportunity to work individually or as a member of a team working on a small group design brief. You will have to design, develop and test your ideas until you find a solution to meet your brief. You will develop skills to become a supportive team player able to undertake research accessing a variety of sources. You will be able to produce written and practical evidence to support your development work. The variety of skills you will learn at Year 10 Food Technology lead smoothly on to Year 11 and beyond. This course involves working within a context to develop technological products. It builds on the Year 9 General Technology Course. You will generate ideas that will allow you to develop a range of outcomes. In the development of your ideas you will be investigating existing products to identify the key attributes that make products successful. You will make mockups or models that can test your ideas, then use a range of hard materials to develop those ideas into a final outcome. You will learn new skills and knowledge and develop strategies to embrace challenge. You will have the opportunities to work on individual projects and group projects. You will have the opportunity to develop a wide range of skills and knowledge that will prepare you for NCEA Level 1, 2 and 3. There are many Technology related careers and University courses that have Technology as an entry subject. You will also have the opportunity to sit an NCEA Achievement Standard to gain credits as you work through one of your projects. This course involves developing a range of outcomes related to Fashion and Design. You will learn about the Fashion trends of the past and how they have influenced Fashion today. You will develop knowledge and skills to make items that meet a given Design Brief or Challenge following the Design Process. You will explore who you are in a conceptual form and learn the skills of design, including looking at digital designing. You will then transfer these new design skills and look at ‘who you are’ to influence the design and making of a ‘personal item’. This will allow you to express yourself in a unique way, while also gaining fundamental design skills and more specialist construction skills. You will conduct some research into your culture and heritage to find similar existing products, suitable materials and learn how to manipulate a range of different materials. After the introductory project you will be given the opportunity to Design and Make items suitable for a personal project or you may wish to get involved in a community project. Or enter a competition such as the local schools Wearable Arts Competition and/or the National Brother Design Stars Competition. You will also have the opportunity to sit NCEA Achievement Standard 91060 Demonstrate understanding of basic concepts used to make products from textile materials or Achievement Standard 91045 Use planning tools to guide the technological development of an outcome to address a brief. Digital technology is a University approved course and in secondary schools continues to Year 13. As this is a new, Year 10 option course for 2017 students and will begin with an introductory unit which will equip them with the required skills to proceed to programming and use of microcontrollers with the intended outcome of being able to design, manufacture and programme an autonomous robot. The course is biased towards practical outcomes but students must be prepared to complete all areas of the course including theory and assignment work. Students who opt to take this course do not need any prior knowledge or experience of electronics or programming a willingness to learn and a strong work ethic is required. Students taking this course will have the opportunity to participate in relevant NCEA level one digital technology achievement standards. In Year 10 Drama you will build on some of the performance skills developed in Year 9 such as Drama Techniques, Drama Elements and Drama Conventions. You will work in groups to develop performance pieces and perform for students at MHJC and the wider community. There will be an opportunity to participate in an NCEA assessment and to prepare for option choices at Year 11. You will learn to work with a wide range of people in various situations. You will develop your communication abilities and confidence in public forums. An interest in performance techniques and creating original work for an audience would be of benefit but these skills will be taught during the course so are not essential. Enthusiasm and a willingness to try everything are essential. The skills acquired in Drama can be fed into any number of pathways. Being able to speak with confidence in a public situation is an invaluable asset in many other subject areas that involve discussion and presentation. Being able to work cooperatively and creatively in a group develops excellent problem solving skills that can be applied to many areas. Year 10 Music will see a development of the skills learned in Year 9. Practical work will largely focus on group and solo performance as well as song composition. The course will involve an NCEA unit based on digital aspects of music using programs such as MuseScore and Ardour. You also will have the opportunity to record one of your own songs. There will be an element of the theory of minor and major scales and the investigation of chords in a key. Learning to develop confidence when performing is a huge part of music at year 10 and plenty of opportunities, both formal and informal will be offered as an opportunity to shine. Spanish is one of the most widely spoken languages, there are more Spanish than English speakers in the world. There are over 350 million native speakers of Spanish in twenty two countries. The Year 10 Spanish course teaches not only a lively and expressive language, but a fascinating and different culture. to describe themselves and others. To describe places and other things. to use articles and adjectives applying correct grammar. to conjugate verbs with confidence. about Spanish and Latin american lifestyle, festivities and traditions. experiencing field trips where they will apply their conversational skills. having an opportunity of gaining 4 credits for NCEA Level 1and earning a Spanish Certificate in language competence from the Australian Council of Educational Research. Learning Spanish will give students the possibility to understand other Latin based languages like Portuguese and Italian. Year 10 Spanish is a preparatory year to go further and study Spanish at a professional level giving you the chance of having a success. Please note the following selection restriction that is applicable to the Technology Options, Languages and Visual Art/Design & Visual Communication. In Year 9 Drama you will build on basic performance skills such Drama Techniques, Drama Elements and Drama Conventions. These skills will assist them in performing in a range of situations. There will be an opportunity to create props and costumes for Drama. You will learn to work with a wide range of people in various situations. You will develop communication abilities and confidence when performing in public. An interest in performance techniques and creating original work for an audience would be of benefit but these skills will be taught during the course so are not essential. Enthusiasm and a willingness to try everything are essential. The skills acquired in Drama can be fed into any number of pathways. Being able to speak with confidence in a public situation is an invaluable asset in many other subject areas that involve discussion and presentation. Being able to work cooperatively and creatively in a group develops excellent problem solving skills that can be applied to many areas. There is a $10 charge associated with this course to cover materials for mask making. In Year 9 Music you will develop as a musician on your chosen instrument. You will further develop your experience and skills in performance, both solo and in a group. You will learn to set up stage equipment such as speakers and mixing desks. You will also experience writing your own song. There will be an element of theory in terms of learning major and minor scales as well as working out chords in a key. There will be a chance to use digital audio software to create original mixes. The Year 9 Mandarin course covers language and culture; exploring both modern and traditional aspects of China. Students will experience a variety of learning opportunities, such as stories, games, Chinese celebrations, Chinese history, Chinese culinary, Chinese craft and art, and school trips. Authentic learning experience and e-learning will be embed in daily lessons. This course is open to both native speakers of Mandarin and non-native speakers. It will cater for the needs of individual students and ensure they progress further in their own pathways. Spanish is one of the most widely spoken languages, there are more Spanish speakers in the world than English speakers. There are over 350 million native speakers of Spanish in twenty two countries. The Year 9 Spanish course teaches not only a lively and expressive language, but a fascinating and different culture. Learning Spanish will provide the possibility to understand other Latin based languages like Portuguese and Italian. Our language softwares “Linguascope and Language Perfect” interacting within the class using their acquired, written, reading and speaking knowledge. Experiencing field trips where they will apply their conversational skills and exchange with other spanish students from other schools in New Zealand. Students will given opportunities to develop ideas, skills and techniques in drawing, painting, printmaking, sculpture, design and time based art through a series of practical projects representing a variety of contexts. This is a course with the emphasis placed on creativity and individual choice, developed to meet the needs of today’s students and tomorrow’s citizens. The programme is developed around briefs that are based on realistic and thought provoking situations. Students will use graphics skills to develop, record and communicate individual and innovative solutions in a variety of ways. This course stimulates students’ self confidence, self esteem and pride in achievement through enabling them to reach personal success. This course involves using technological practice to develop food products that meet a design brief. You will have to design, develop and test your ideas until you find a solution to meet your brief. You will learn to think creatively and to work independently. You will develop skills to become a supportive team player able to undertake research accessing a variety of sources. You will be able to produce written and practical evidence to support your development work. The variety of skills learnt in Year 9 Food Technology lead smoothly on to Year 10 and beyond. These skills will help with production of work in other curriculum areas and problem solving skills, developed through the design briefs, will be of use across the curriculum. This course involves developing outcomes to meet a given brief. In the development of your outcome/s you will make models or mockups that will test your ideas prior to working through the construction process. You will have the opportunity to use a range of hard materials to produce your final outcome – choosing the best materials that will enable your outcome to be “fit for purpose”. This course requires creative and critical thinking. You will enhance your patience, enthusiasm and ability to work individually and in a group. The variety of skills and knowledge you develop will lead you into the Year 10 Technology course. You will also be able use the knowledge you develop in Technology in other curriculum areas. Digital technology is a University approved course and in secondary schools continues to Year 13. This MHJC course will align to the digital technology section of the Technology Curriculum. The course is biased towards practical outcomes but students must be prepared to complete all areas of the course including theory and assignment work. Students who opt to take this course do not need any prior knowledge or experience of electronics or programming but a willingness to learn and a strong work ethic is required. You will explore who you are in a conceptual form and learn the skills of design, including looking at digital designing. You will then transfer these new design skills and look at ‘who you are’ to influence the design of a ‘personal item’. This will allow you to express yourself in a unique way, while also gaining fundamental design skills and more specialist construction skills. In Media Studies you will learn to explore media concepts with critical awareness and have practical experience in production work. This course can give you essential skills and expertise as you progress to senior Media Studies, and beyond. You will develop the ability to communicate confidently as you work in production groups developing media products such as short films. You will develop flexibility, problem solving and openness to new ideas. You will experience “hands-on” use of technology such as cameras and digital editing software. You will be able to critically interpret a wide range of media. product to fit a brief. Social Enterprise is ‘doing charity by doing trade’. A social enterprise company is any for profit or non-profit organisation that applies strategies to achieving philanthropic goals. Social enterprises would consider themselves to have social objectives.Social enterprises do not aim to offer any benefit to their investors, except where they believe that doing so will ultimately further their capacity to realise their philanthropic goals. You will be involved in exciting project work and you can interact with people in New Zealand and around the world. Our Whanau are central to everything we do at MHJC. They operate as communities, which promote effective learning, pastoral care and positive competition. Students will be allocated to a Whanau on entry to the school and will almost always remain as a part of that community. Staff may be moved between whanau where timetabling needs dictate. Each of our Whanau represent an integral part of New Zealand; the Coast, Forest, Water and Mountains. These are represented in our logo by the 4 coloured koru, gold, green, blue and white. 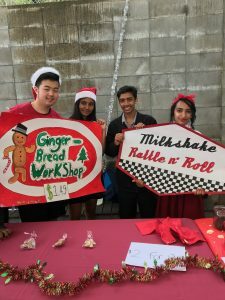 Teachers may teach across more than one Whanau but will be aligned with a Whanau for activities, competitions and events. Students and staff both enter into the spirit of the Whanau community which provides a strong sense of fun, pride and belonging. National Standards are a description of what all New Zealand students are expected to be able to do in reading, writing and mathematics in Years 1-8. The National Standards have been developed by the Ministry of Education and subject experts. They are being introduced to give teachers, your child and you a clear idea of where your child is at in reading, writing and mathematics. They tell you what your child needs to do next in their learning. If your child is working at, or above the standards during Years 1-8 it means your child should be on track to finish secondary school with a qualification such as NCEA Level 2.
your child assessing their own work and work of other students in their classes. If your child needs more time to work towards the expected standard, the teachers will work with you and your child to help them achieve their next learning goals, with self-reflection and goal setting (completed following our Student-Led Conferences). What will the assessment data be used for? report clearly to you via our e-National Standard Reports twice a year about your child’s progress and achievement in relation to the standards. When will the reporting be carried out? In Terms 2 and 4, all Year 7 and 8 students will be assessed against the National Standards. How well is your child doing? Your child’s progress and achievement in relation to the National Standards in reading, writing and mathematics will be reported using our Mission Heights Junior College ‘WAME’ (Working Towards, Achieved, Merit and Excellence). Please note: the Achieved level is the standard we expect students to reach by the end of the year.